Survivor: Social Media Island meets Blogging Idol meets RSS Makeover meets The Biggest Poster. 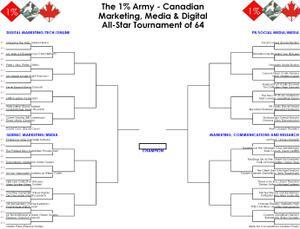 We've had 54 blogs already submitted for the 1% Army Tournament. I hesitate to call it a tournament of 64 as we have more than enough English and French Canadian marketing/media/digital blogging talent to do a 128. It's a fun way of getting noticed, talked about, exchanging ideas and joining a community of your Canadian marketing/media blogger brethren (or what we call the 1% army). Our Bracket: Our preliminary tournament structure is listed under the photos of our Facebook group http://www.facebook.com/group.php?gid=2461514107 - this is a stacked competition with a lot of really interesting and insightful blogs. Join a community of passionate social media enthusiastS as a participant or spectator. Please ensure you get slotted in the right division. Casting call for Judges: We're also looking for a set of judges, my temptation is to go outside of Canadian borders for 5 judges - if you know someone who would be interested, let me know.